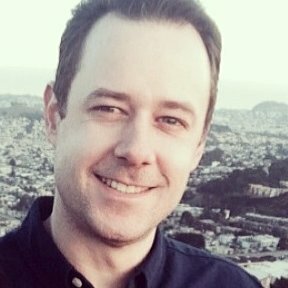 How do I create an approval type form? I am looking at JotForm to see if it can help in my office. I am needing some form buildiner that will allow the Initial User (A) to enter data which would then go to user B to apporove or deny, to then go to user C to approve or deny with an approval or denial message going back to previous users. For Example: Day off Request-It should go form the worker to the supervisor and I would like the supervisor to be able to approve or deny it with a response sent back to the worker. First of all, let me suggest you to create a free account to store your form and its data, otherwise you run the risk to loose the access to your form. After creating your new account contact us in a new thread requesting us to transfere your form to the new account. Now, in regards to your question, you can accomplish what you need by applying condtional logics (Send Email submission). However, I will make an example form for you and will get back to you once I have finished my form and will give you an step by step guide to know how to accomplish what you need. 1. First, after the submit button add a Form collapse, a Radio Button field and a Text Area field to let the supervisor to enter his message. 2. 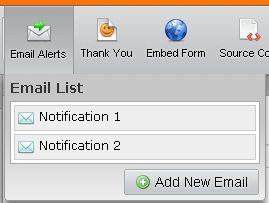 Create two Notification Emails. One will be sent to the supervisor and the another will be sent to the worker when the supervisor approves/denies the request. A- In the first one add the Edit Link to let the supervisor edit the form to approve/deny the request. 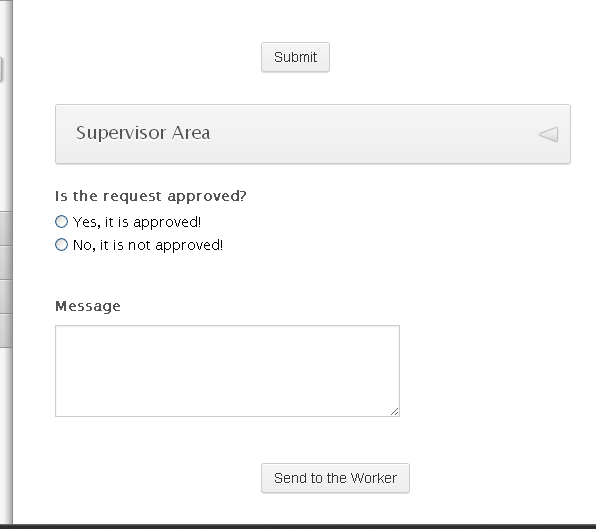 B- With the second one you will create the condition to send this email to the worker to let him know if the supervisor's approved/denied the request. 3. 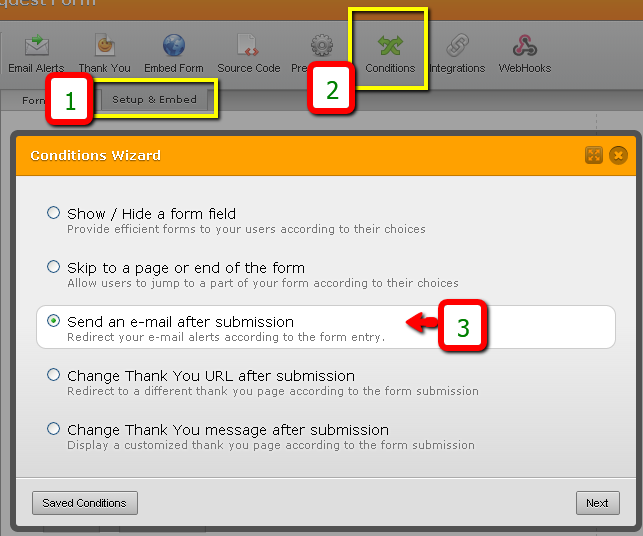 Choose Send an email after submission and click on Next button. Finally save your form and test it. Here is my form: https://www.jotform.com/form/32545968641969 you can clone it if you think it would be helpful for you. I hope this helps, but if you need further assistance, don't hesitate to contact us. I'm trying to make this type of form but i can't find how to make the "Send to the Worker" button. You don't describe how to make this last button to send the approval to the worker. Can you please explain me ? @karimido, your concern will be addressed in another thread to assist you better, since this is an old one. We will attend to it separate. Interesting...can the "approver" make edits to the form before submission? That would depend if the approver has the edit link submission. 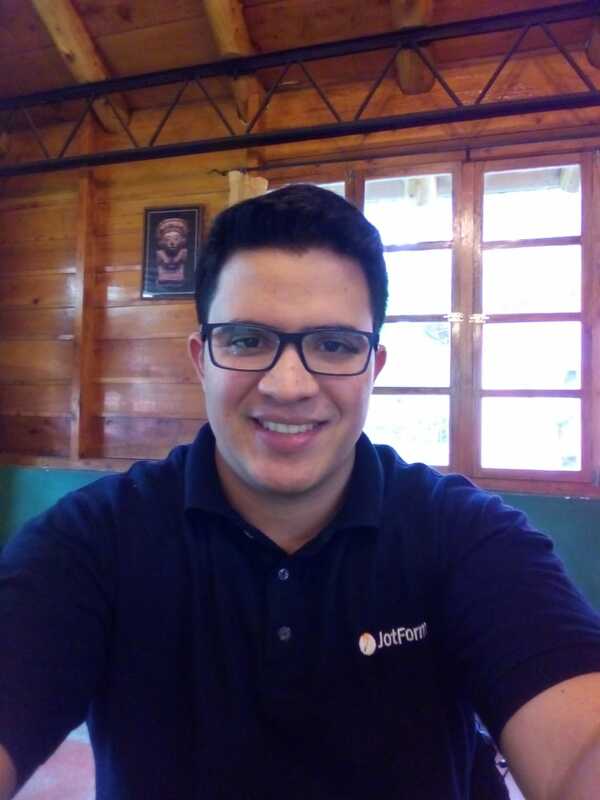 This is quite an old thread, to better assist our users, we advise them to create their own thread using this link: http://www.jotform.com/contact/. Can the same request be sent to more than one 'supervisor' at the same time?